Chhita Pitha/ Rice Net / Chhita ruti is a wonderful net texture rice crepe with delisious taste and it is gluten free too. This pith goes well with meat curry specially beef and duck. Make sure that you are using fine rice flour and make a smooth batter. Hope you will like it. Also needs non stick pan(preferable). 1. Make batter with rice flour, water and salt. 2. Heat the pan on medium heat. When the pan is ready, add 2-3 drops oil and with a paper towel spread it out. 3. Dip your five fingers in batter and sprinkle batter with your fingers on pan. Do that 3 times. 4. Wait till it will come out bit from pan and fold in quarter and remove from pan with a spatula. After making each pitha use paper towel to wipe the pan and use oil if needed . 5. 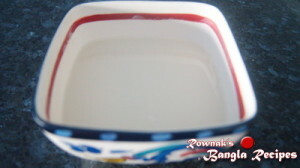 Serve Chhita pitha/ Rice net / chhita ruti with beef curry or any meat curry. Tips: Every time you sprinkle batter, give a mix in batter. Thanks. Every pitha or recipe has different name for different district. We call it chhita pitha. .but it is good to know you call it chhita ruti.. I will add that too. 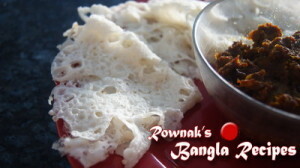 Did you use the store bought rice flour for this pitha, hridoy horon pitha and fuljhuri pitha? Thanks in advance. Yes I used store bought rice flour in those three pitha. Hi rownak do you have any new recipe, I haven’t received any lately.Am I still on your mailing list,if not please put me back again.i love your recipe, I learned a lot from you. Thank you, I love you.